In about 24 hours, a year’s worth of speculation and prognostication will be put to rest and the results will speak for themselves. Until then, enjoy our final mock draft. It’s chock full of speculation. Update: Let’s say it came down to a final look between Hultzen and Gerrit Cole. Cole was 7.1IP 11H 3ER 1BB 11K in a Loss to San Francisco while Hultzen was 7IP 3H 1ER 1BB 12K in Win against St. John’s. Previous Mocks: 1.17 Anthony Rendon, 2.22 Anthony Rendon, 5.6 Anthony Rendon, 6.2 Gerrit Cole. Update: Teams now have Rendon’s medical records. If they still have concerns over shoulder, look for Francisco Lindor here. Previous Mocks: 1.17 Matt Purke, 2.22 Gerrit Cole, 5.6 Gerrit Cole, 6.2 Anthony Rendon. Update: Hultzen if available. If not I think it’s Bauer over Cole. Previous Mocks: 1.17 Gerrit Cole, 2.22 Matt Purke, 5.6 Sonny Gray, 6.2 Danny Hultzen. Update: Bundy makes so much sense, but it’s far from certain. Gerrit Cole would be another possibility here. Previous Mocks: 1.17 Bubba Starling, 2.22 Taylor Jungmann, 5.6 Dylan Bundy, 6.2 Dylan Bundy. 5. Kansas City Royals – Gerrit Cole – RHP – UCLA. 6’4″ 220. Last Drafted: New York Yankees – ’08 (1st Round). Update: The Royals reportedly covet Cole and would jump on him if he slides. Previous Mocks: 1.17 Taylor Jungmann, 2.22 George Springer, 5.6 Bubba Starling, 6.2 Trevor Bauer. Update: Stephen Strasburg, Bryce Harper and Bubba Starling. Some big names for fans to get excited about. Mike Rizzo isn’t afraid to pay. Previous Mocks: 1.17 Daniel Norris, 2.22 Sonny Gray, 5.6 Danny Hultzen, 6.2 Bubba Starling. Update: I think Sonny Gray, Matt Barnes and Taylor Jungmann would make sense here assuming they’re singable, but they love Lindor. Previous Mocks: 1.17 Jackie Bradley Jr., 2.22 Jackie Bradley Jr., 5.6 Francisco Lindor, 6.2 Sonny Gray. Update: Cleveland likes taking college arms early and Sonny Gray, Taylor Jungmann, Jed Bradley would make sense, but Archie Bradley is worth breaking from the norm. Previous Mocks: 1.17 George Springer, 2.22 Archie Bradley, 5.6 Taylor Jungmann, 6.2 Archie Bradley. 9. Chicago Cubs – Sonny Gray – RHP – Vanderbilt. 5’11” 180. Last Drafted: Chicago Cubs – ’08 (27th Round). Update: The Cubs are a wild card and after 5 months of speculation, I’m back to thinking they’ll take Sonny Gray as they did in 2008. Taylor Guerrieri, Archie Bradley and Francisco Lindor are other popular ties. Previous Mocks: 1.17 Sonny Gray, 2.22 Bubba Starling, 5.6 Taylor Guerrieri, 6.2 George Springer. Previous Mocks: 1.17 Archie Bradley, 2.22 Matt Barnes, 5.6 Trevor Bauer, 6.2 Matt Barnes. Update: Jumgmann could be the NCAA Player of the Year. Other options for this pick include Gray, Barnes, Jed Bradley and any other college arm that slips. Previous Mocks: 1.17 Dillon Howard, 2.22 Daniel Norris, 5.6 Archie Bradley, 6.2 Taylor Jungmann. Update: If it’s not a college arm, I think it’s either Lindor or Javier Baez. Previous Mocks: 1.17 Matt Barnes, 2.22 Dylan Bundy, 5.6 Jed Bradley, 6.2 Jed Bradley. 13. New York Mets – Taylor Guerrieri – RHP – Spring Valley HS (SC). 6’3″ 180. College Commitment: South Carolina. Update: I’ve been all over the place for the Mets. Now I’m thinking either college arms (would love Sonny Gray) or Taylor Guerrieri, who trails only Bundy and Bradley in the prep arms ranking. Previous Mocks: 1.17 John Stilson, 2.22 Francisco Lindor, 5.6 George Springer, 6.2 Levi Michael. Update: Marlins have a history with Mahtook, whom they selected in 2008. Previous Mocks: 1.17 Dylan Bundy, 2.22 Jed Bradley, 5.6 Daniel Norris, 6.2 Mikie Mahtook. 15. Milwaukee Brewers (for failure to sign Dylan Covey) – Levi Michael – SS – North Carolina. 5’10” 180. Bats: B Throws: R. Last Drafted: Never. Update: This pick needs to be singable. Michael fits the bill. 16. 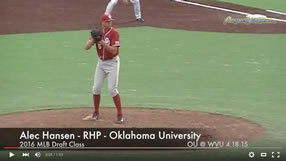 Los Angeles Dodgers – Robert Stephenson – RHP – Alhambra HS (CA). 6’2″ 185. College Commitment: Washington. Update: All indications are that the Dodgers won’t be permitted to go over slot and that Stephenson is signable. A perfect marriage, which is rare for the Dodgers. 17. Los Angeles Angels – Javier Baez – SS/3B – Arlington Country Day HS (FL). 6’1″ 205. College Commitment: Chipola JC. Update: This would be Lindor’s floor. I think they take Baez or a prep arm (Dillon Howard, Henry Owens, Daniel Norris). Update: It’s going to be a college bat here and my previous two predictions Mahtook and C.J. Cron are still in play, but the slide of Springer will end here. Previous Mocks: 1.17 Josh Bell, 2.22 Anthony Meo, 5.6 Mikie Mahtook, 6.2 C.J. Cron. Update: I appear to be relying heavily historical ties between players in my final mock. Gray to Cubs, Mahtook to Florida and now Meyer to Boston. Previous Mocks: 1.17 Francisco Lindor, 2.22 Jason Esposito, 5.6 Alex Meyer, 6.2 Alex Meyer. 20. Colorado Rockies – C.J. Cron – 1B – Utah – Jr. Bats: R Throws: R. 6’4″ 230. Last Drafted: Chicago White Sox ’08 (44th Round). Update: Wong still in play here but Cron has proved to be one of the better college bats in this draft. Previous Mocks: 1.17 Tyler Anderson, 2.22 Dillon Howard, 5.6 Dillon Howard, 6.2 Kolten Wong. 21. Toronto Blue Jays – Andrew Chafin – LHP – Kent State. 6’2″ 190. Last Drafted: Never. Update: Toronto has been linked to Chafin and after beating Taylor Jungmann and Texas on Saturday, I no longer think he’ll be available in the supplemental round. Previous Mocks: 1.17 Jason Esposito, 2.22 Tyler Anderson, 5.6 Tyler Anderson, 6.2 Tyler Anderson. 22. St. Louis Cardinals – Jose Fernandez – RHP – Alonso HS (FL). 6’3″ 230. College Commitment: South Florida. Update: Dillon Howard, Daniel Norris and Henry Owens all possibilities here. Previous Mocks: 1.17 Derek Fisher, 2.22 John Stilson, 5.6 Jackie Bradley Jr., 6.2 Taylor Guerrieri. 23. Washington Nationals (from White Sox for Adam Dunn) – Tyler Anderson – LHP – Oregon. 6’3″ 195. Last Drafted: Never. Update: Maintaining my comment from Mock 4.0 “If Alex Meyer were to slip, the Nats would select him before the Cardinals left the podium“. Previous Mocks: 1.17 Alex Meyer, 2.22 Josh Bell, 5.6 Josh Bell, 6.2 Dillon Howard. Update: With 12 picks in the top two rounds, the Rays will need to mix in some affordable safe players. Wong is just that. Previous Mocks: 1.17 Brandon Nimmo, 2.22 Henry Owens, 5.6 Henry Owens, 6.2 Henry Owens. Update: I wouldn’t rule out the Pads using the 10th overall pick on Spandenberg, so they’d love it if he fell here. Previous Mocks: 1.17 Anthony Meo, 2.22 Kolten Wong, 5.6 Andrew Susac, 6.2 Andrew Susac. Update: The Red Sox could take a shot at Josh Bell, who recently asked MLB teams not to draft him. Swihart is another expensive prep star and the Red Sox might even take him at #19. Previous Mocks: 1.17 Jose Fernandez, 2.22 Jose Fernandez, 5.6 Jose Fernandez, 6.2 Josh Bell. 27. Cincinnati Reds – Grayson Garvin – LHP – Vanderbilt. 6’6″ 220. Last Drafted: Houston Astros – ’08 (45th Round). Update: Cincinnati would love for Tyler Anderson, Jed Bradley to fall. Florida State’s Sean Gilmartin and Oregon State’s Josh Osich are other possibilities. Left handed college pitching seems to be the theme. Previous Mocks: 1.17 Alex Dickerson, 2.22 Alex Dickerson, 5.6 Levi Michael, 6.2 Brian Goodwin. 28. Atlanta Braves – Daniel Norris – LHP – Science Hill HS (TN). 6’3″ 180. College Commitment: Clemson. Update: Henry Owens is another possibility. A sleeper here would be Tennessee prep product Nickey Delmonico. Previous Mocks: 1.17 Zach Cone, 2.22 Zach Cone, 5.6 Brian Goodwin, 6.2 Jose Fernandez. 29. San Francisco Giants – Joe Ross – RHP – Bishop O’Dowd HS (CA). 6’2″ 180. College Commitment: UCLA. Update: Strong link here but Keith Law has Ross going as high as #9. Previous Mocks: 1.17 Jed Bradley, 2.22 Brian Goodwin, 5.6 Jason Esposito, 6.2 Daniel Norris. 30. Minnesota Twins – Andrew Susac – C – Oregon State. 6’1″ 205. Bats: R Throws: R. Last Drafted: Philadelphia Phillies – ’09 (16th Round). Update: Nobody knows what Minnesota is thinking. Also linked to low ceiling, high floor college pitchers. Previous Mocks: 1.17 Noe Ramirez, 2.22 Brandon Nimmo, 5.6 Nicky Delmonico, 6.2 Blake Swihart. Update: I still like the Nimmo link, as I’ve been on it since early May. Previous Mocks: 1.17 Logan Verrett, 2.22 Andrew Susac, 5.6 Brandon Nimmo, 6.2 Brandon Nimmo. 32. Tampa Bay Rays – Henry Owens – LHP – Edison HS Huntington Beach (CA). 6’5″ 185. College Commitment: Miami (FL). Update: This would work out well for Tampa. Assuming they go bat, bat with their first two picks, Owens would be a coveted pitcher at this point. Update: Extremely advanced glove for a prep backstop. Modest ceiling with the bat. Previous Mocks: 1.17 Mikie Mahtook, 2.22 Mikie Mahtook, 5.6 Charlie Tilson, 6.2 Austin Hedges. Brian Goodwin – OF – Miami Dade JC. 6’1″ 190. Bats: L Thorws: R. Last Drafted – Chicago White Sox – ’09 (17th Round).